Optical Crystal Arch Award SY2058. 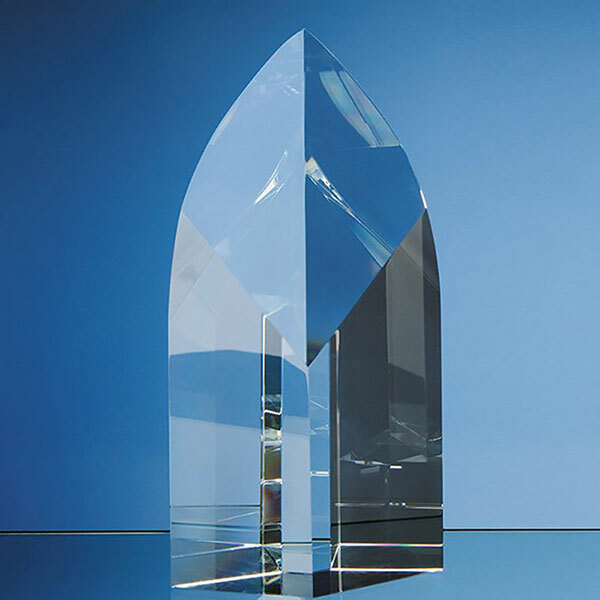 A fine quality optical crystal award with an arch design, 22.5cm tall and ideal as recognition awards, corporate gifts or presentation items. Supplied presentation boxed. Offered with engraving and/or colour print options. These 22.5cm tall modern awards combine the elegance of a gently curved arch shape with the precision cut of a diagonal plane. Crafted in flawless optical crystal, the angles of this award ensure that it refracts the light in a myriad of ways, always offering a different aspect and sparkle. The dramatic diagonal plane, cut from the top of the back to low down on the front, offers a perfect location for adding your event or achievement details. These awards are offered with engraving and/or colour print options, allowing you to create unique recognition or achievement awards or personalised items. An optional 3x5in clear crystal base is available with these awards. These contemporary crystal awards are supplied with a black foam-lined presentation box.